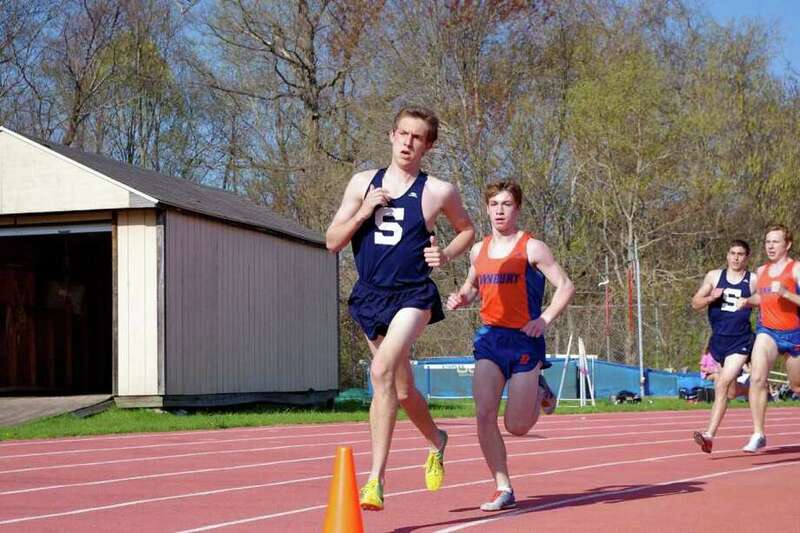 Staples sophomore Henry Wynne ran a leg for two winning relay teams and took second in the mile in helping the Wreckers split a home tri-meet with Danbury and Bassick Tuesday. The Staples boys outdoor track team knew the stakes were high on Tuesday. The winner of its home meet against Danbury would determine the Western Division champion. Both teams gave it their all, but unfortunately for Staples, Danbury came out on top, 82-68. Wreckers senior captain Ben Aldrich said, "It's not fun to lose, but we all have a lot of respect for Danbury and they had the better day." Stapes defeated Bassick, 144-6 in this tri-meet and is now 4-1 after the split. Sophomore Henry Wynne said, "We were expecting Danbury to be very tough competition, because they are known as a very good overall team. We were not as worried about Bassick, but knew they might have a few good runners." Staples' strategy was to try to take points in the events they knew they could get them in. Aldrich said, "In a close meet like this, every performance counts." Although the Wreckers did not come out on top, there were still many standout performances. Junior Dean Hefnawy took first in the pole vault, clearing a height of 13'9". He said, "I am ok with me performance but I wish I could have gone a little bit higher. Also it was nice to have some competition because at the all the other meets that I have been at there haven't been any vaulters." Aldrich placed second in the 2-mile with a time of 10:11. He is somewhat pleased with his performance and said, "My time was a little slow but I was still beat up from a tough 2 mile on Saturday where I ran a 9:54." Staples won the 4x400 meter and 4x800 meter relays. Wynne was a member of both winning teams and also took second place in the mile. He said, "I was pleased with my performance, but also know that I can do much better and was feeling sick the day of the meet but tried to perform my best." In addition, Wrecker senior captains Raphael Ray and Jack Roche won the 200-meter dash and 800 meters, respectively. The Wreckers will compete at the O'Grady Relays invitational tomorrow and they know there will be tough competition, but Wynne hopes the team will do well. He said, " Our expectations are to run the best relays we can an hopefully get some gold."